Floors must withstand your lifestyle. They get nicked by high heels, crusted by muddy boots and crushed by furniture legs. Sunlight, moisture, pets, stains, spills and childhood accidents all leave marks. Yet, it's common to focus on how a floor covering looks and forget how it will wear. Whether you are remodeling or building a new home, laminate floors have become a popular choice for active areas in many homes. There is a growing body of literature that suggests that hard flooring surfaces provide a healthier living environment when compared to other flooring options. Larger accumulations of dust, debris and dust mites are often observed in carpets, with some allergists even recommending carpet removal to patients that suffer from acute dust allergies. Alongside the obvious health benefits all laminate floors offer good performance characteristics being incredibly durable, easy to care for and available in a wide variety of realistic stone and wood flooring designs. 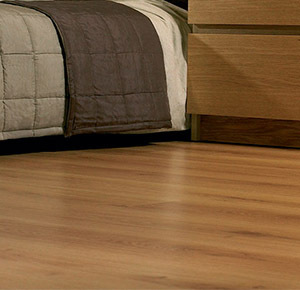 Firstly, laminate flooring manufacturers use sophisticated, computerised technology to create realistic designs that are well protected by a tough outer coating which will stand up to the wear and tear from kids, pets, spills and repeated exposure to sunlight, unlike real hardwood floors. Also, laminate floors can be installed in environments with higher than normal humidity and moisture levels unlike solid hardwood floors, where concerns of warping and gaping is likely due to the wood expanding and contracting. Compared to other flooring solutions, laminate flooring may offer the best value over the longer term. If we compare flooring options over a 25 year period; carpets will need to be replace 2 - 4 times, solid hardwoods will require 3 - 5 refinishing treatments, and vinyl will require replacement at least 3 times. Conveniently, laminate floors come in both planks and tiles and can be floated over most existing floors, subfloors or even on concrete slabs to adjust to the temperature and humidity of the interior environment and save on cost. The range of colours, styles, species and designs in laminate flooring is enormous with a colour and design available to suit every interior style and environment. If you love the look of real hardwood but are concerned with the upkeep and cost, then laminate flooring is the answer. If you are concerned with tearing up old flooring or are budget minded then laminate may also be the best choice. The biggest advantage for choosing pre-finished hardwood is most certainly the selection! There are several types of wood and finishes from which to make your choice. they include, but are not limited to; Oak, Maple, Cherry, Ash, Walnut, Beech or Birch. With exotic woods arriving on the scene the variety and colour selection is almost unlimited.